My review of Mohammad A. Quayum’s The Essential Rokeya: Selected Works of Rokeya Sakhawat Hossain has just been published in Cha: An Asian Literary Journal. Born in 1880 in what is now Bangladesh, and having died in Calcutta in what was still undivided British India in 1932, Rokeya Sakhawat Hossain (whose name can be spelt in a variety of ways) has come to be known as one of Bengal’s first feminists. She is particularly known as one of its first Muslim feminists, especially for writing Sultana’s Dream, a “utopian” novella in which women rule and men are kept in purdah. With The Essential Rokeya: Selected Works of Rokeya Sakhawat Hossain, editor and translator Mohammad A. Quayyum adds to the body of scholarship on this interesting figure, with some previously-untranslated essays, articles, letters and extracts in translation from Bangla as well as some that were originally written in English. Quayyum describes the inclusions as some of Hossain’s best works. 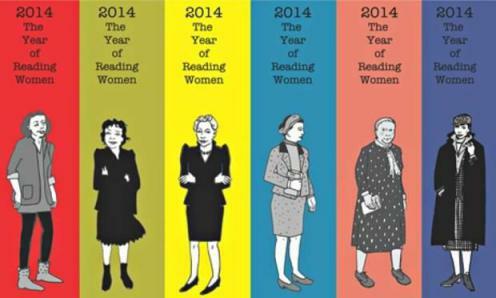 2014 has been designated the Year of Reading Women on a couple of fronts: Critical Flame journal has designated 2014 a year in which they will only read and publish in women writers and writers of colour; Joanna Walsh has started the #readwomen2014 campaign. I am probably in an opposite situation to many readers out there: for the four years that my PhD lasted, I read books almost exclusively by Indian women (apart from a few scholarly books), so when I’d done with the PhD I promised myself that I would read a bit more broadly, including plenty of men! But I’m aware that the literary and publishing establishment the world over still favours men, white men at that. Not always deliberately or consciously, but nevertheless (statistically speaking, anyway) books by women authors receive less attention than books by male authors. Unlike the Critical Flame journal who got the ball rolling, and some other readers and bloggers out there, I’m not going to pledge to read more female authors of colour this year, because I really do think I read plenty–ie, the majority of what I read. But I read a good piece on the Arabic Literature (in English) blog recommending a book by an Arab woman author for every month of the year, as a way in for those readers who perhaps don’t know where to start. January: Manjushree Thapa’s The Tutor of History. I’m not of the opinion that women should always write exclusively about women, as even feminists of some persuasion do. Thapa writes cleverly and humorously about the political and social turmoil of contemporary Nepal, showing that women writers can have enormous breadth of experience and imagination. February: Bapsi Sidhwa’s Ice-Candy Man/Cracking India. This Pakistani author’s fictionalised account of her experiences during the Partition of India in 1947 is published under two different titles. It is a brutal account of the horrors of communalism. March: Anjum Hasan, Lunatic in My Head. This young author from India’s Northeastearn Meghalaya state wittily brings together small town and metropolitan India. April: Mahasweta Devi, Breast Stories. You can’t go wrong with anything by Mahasweta Devi, but this powerful collection from the fierce Bengali author is a good place to start. June: Sorayya Khan, Noor. Khan was one of, if not the first Pakistani English-language novelist to address (West) Pakistan’s crimes in East Pakistan/Bangladesh in 1971. July: Anita Desai, Clear Light of Day or Baumgartner’s Bombay. This prolific Indian author has many short novels to her credit, and has been nominated for the Booker Prize several times, though she has never won. Her daughter, Kiran Desai, won the Booker in 2006 though, with The Inheritance of Loss. Many consider the mother the better writer, and these two suggestions, amongst her best loved, are good places to start. August: Githa Hariharan, When Dreams Travel. Hariharan is also a prolific author, with many good novels. This recommendation is a retelling of the classic Thousand and One Nights. September: Urvashi Butalia, The Other Side of Silence: Voices from the Partition of India. The only work of non-fiction to make this list, Butalia’s work of oral history is a stunning and groundbreaking work of feminist oral history. October: Qurratulain Hyder, My Temples, Too. This Urdu-language Indian author translated her novels into English herself, which many critics say altered them enormously in the process. Several of her novels are sprawling histories, but the English translation of her first novel, My Temples, Too, about India’s Independence, is quite accessible. 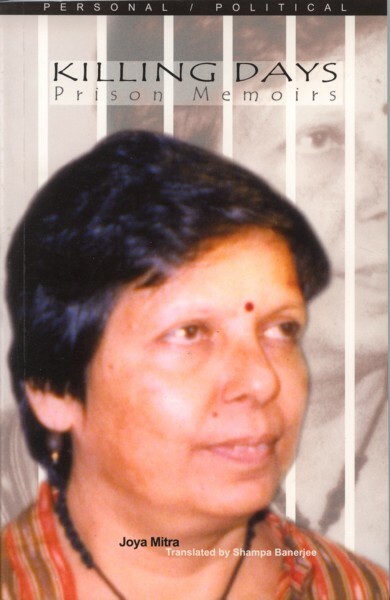 November: Meena Kandasamy, Ms Militancy. The only collection of poetry to make this list (I don’t read much poetry), Kandasamy’s fierce anti-caste and anti-patriarchy poems live up to the collection’s name. December: Arundhati Roy, The God of Small Things. If there’s one novel by a South Asian woman that the wider world is likely to have read, it is this Booker Prize winner. If you haven’t already, you can still fit it in in December! My review of This Side, That Side has just been published in Kitaab. This is an ambitious and innovative production but, perhaps ironically for a collection clearly based around a single theme, lacking in clarity and purpose, says Elen Turner. 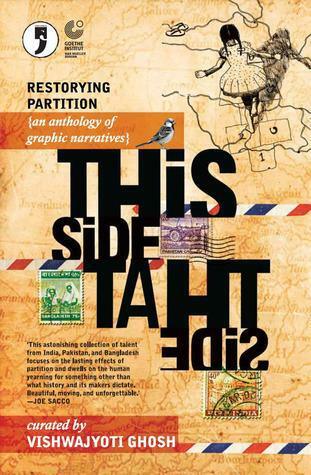 This book represents an ambitious project: to tell stories of the Partition of India through graphic narratives. It contains twenty-eight short pieces on different aspects of the Partition in 1947, from various locations. Present-day India, Pakistan and Bangladesh are all represented, and while most of the texts were originally written in English, a number have been translated from Urdu, Hindi and Bangla. The majority of entries are collaborations between a writer and an illustrator/artist, often in different locations, particularly across national borders. One of the most interesting, beautiful, amusing and original books I have picked up in a long time. Chennai-based publishers Blaft are perhaps best known for their English translations of pulp fiction, particularly from Tamil, but also from a variety of other cultural and linguistic contexts, such as Urdu, and the Nigerian language Hausa. The Obliterary Journal, on the other hand, is a collection of graphic narratives, both extracts from longer works and stand-alone pieces. It has something for almost every taste, artistically and in a literary sense: the precise and detailed line drawings of an extract from “The Hyderabadi Graphic Novel” by Jai Undurti and Harsho Mohan Chattoraj; a translation of a Bangla piece, “Nowhere to Run”, by Anasua and Subrata Gangopadhyay, translated by Sreyashi Dastidar; a hilarious translated extract from “Stupid Guy Goes to India” by Japanese manga artist Yukichi Yamamatsu, which must be read “backwards”, in keeping with Japanese books; a photo essay of colourful vehicle art, mainly of Bollywood stars, which is an extract from “Shaved Ice and Wild Buses: Street Art from Suriname” by Tammo Schuringa and Paul Faber; and so much else in between. A brilliant touch is the contents page, which is a photograph of a large wall painted with all of the publication and contents details of the book. It seemed apt considering Chennai’s reputation for hand-painted film billboards. 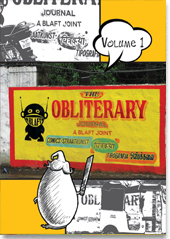 The Obliterary Journal is a difficult book to discuss without a proper vocabulary for graphic narratives and comics, which I’m afraid I don’t possess. But perhaps that’s a good thing. Having become entrenched in academia (for better or worse) I find it difficult to read books these days without appraising them in the language of literary criticism. I couldn’t do that for this book, as it spilled outside of my neatly constructed boundaries. But I liked it. I recommend it. It is fun. And I really hope there will be further volumes. I got my third journal article published! This one has been in press for a very, very long time, so good to see it finally off my hands! It’s in the journal Contemporary South Asia (vol. 20, issue 3) which is not an open-access journal, you’ll need a library subscription to see this one. Contemporary Indian feminism is concerned with a number of social justice issues, including the circumstances under which ‘adivasis’ or tribal people, live. India has a large body of work on these peoples, but much of this romanticises them and fails to treat them as the inhabitants of a modern, industrial and globalising India. In this article, I discuss two works published by Indian feminist presses that provide new and alternative ways of representing adivasis. Anita Agnihotri’sForest Interludes: A Collection of Journals and Fiction is a multi-genre collection that reflects the author’s time spent as an IAS officer in adivasi regions of eastern India. Agnihotri plays the dual role of privileged outsider and informed insider, which lends her narrative a forceful authority. Bhaskaran’s life story of the Keralite adivasi activist C.K. Janu, Mother Forest: The Unfinished Story of C.K. Janu, attempts to present adivasi politics as relevant to modern India, yet the formal structuring of the text and the stylistic choices made by the translator and editors undercuts this. Both Forest Interludes and Mother Forest contain formal and stylistic innovations and, though not without problems, they represent a promising departure from traditional literary representations of adivasis – a departure that situates these subaltern peoples within a more contemporary discursive field. Is it appropriate to call a prison memoir beautiful? Because I think this one is. Joya Mitra, a prolific Bangla novelist, poet and translator, was imprisoned as a young woman between 1970-74 because of her involvement with the Naxalite (Maoist) movement in West Bengal. This memoir is not about the politics or the circumstances that put her there. But, unlike Anjum Zamarud Habib’s Prisoner No. 100 (which I reviewed earlier), this omission does not seem like a lack. Habib’s memoir attempted to present the injustices meted to Kashmiris in India without really delving into the necessary politics, whereas Mitra’s memoir is about individual strength and patriarchal injustice, not politics per se. Compassionate and observant, Killing Days is essentially a series of portraits of Mitra’s fellow prisoners in rural Bengali and Calcutta jails. It explores the sad, tragic, circumstantial and deliberate crimes that put the women in prison, and highlights the injustices of a patriarchal society that forced them there.